You are here: Home ∼ 2013 ∼ November ∼ Bitcoins. They’re wierd. 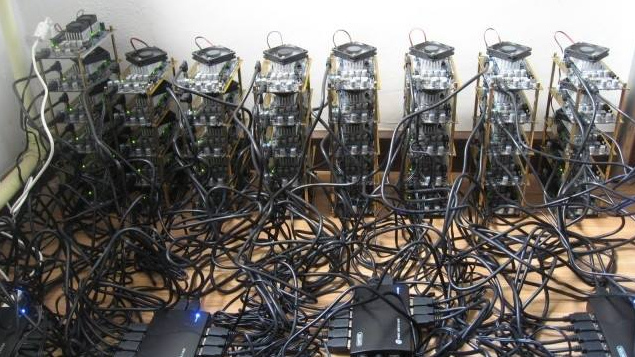 A friend of mine posted a picture of a bitcoin mine, over on facebook earlier today. He went on to say that bitcoins were making more than his regular job at the moment, possibly thanks to the recent price hike, where they topped off at a record high a few days ago of $674.38. Bitcoins have trebled in value since October. It’s starting the be a serious player on the currency market. If you can can be bothered to buy and power this many computer processors (that’s what these are, in abundance) then you may eventually make a few quid profit from mining bitcoins. Technically – for those of us old enough to remember Seti@Home, back in the day when it was quite a cool project, it’s a bit like that. For those of you who don’t know it, Seti was (is) where we left our screensavers on Seti mode to crunch data from the white noise of space to see if there were any patterns that migh suggest aliens. Instead of aliens, it’s crunching complex mathematical problems to processing transactions. 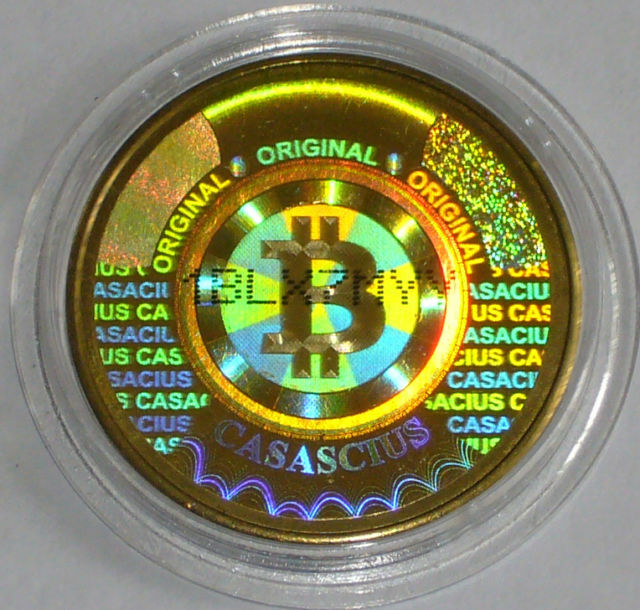 Bitcoins are virtual, yet some really exist. don’t really exist yet real stuff can be bought with them. There have been pressings of real work bitcoins. There’s one going on ebay at the moment for $75,000. (Don’t worry though, it’s free P&P). Here’s what it looks like..
Bitcoin has been called a cryptocurrency because it is decentralized and uses cryptography to control transactions and prevent double-spending, a problem for digital currencies. Once validated, every individual transaction is permanently recorded in a public ledger known as the blockchain. Payment processing is done by a network of private computers often specially tailored to this task. The operators of these computers, known as “miners”, are rewarded with transaction fees and newly minted Bitcoins. However, new bitcoins are created at an ever-decreasing rate. They’ve taken a lot of stick recently – particularly from the authorities, as they’re often used to trade illegal commodities on line such as drugs. Uber geeks at one end, drug dealers at the other. The governments of the world are taking notice – especially after some recent who haa over the closing of Silkroad and the opening of Silkroad 2.0 (A site where commodities (often illegal) are sold in bitcoins). Weird huh? To paraphrase Thomas Carper – Scary and weird. The safest way to store bitcoins is on secure paper wallets. Come on – that’s weird right? Given the recent spike in it’s value, and the recent media interest, I’m wondering where it goes next. It could explode, it could implode, It could vanish over night. Weird.